Vincent Van Gogh was a Dutch painter whose formal distortions and humanistic concerns made him a major pioneer of twentieth-century expressionism, an artistic movement that emphasized expression of the artist's experience. 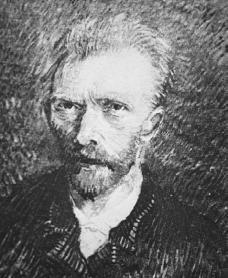 Born on March 30, 1853, at Groot-Zundert in the province of Brabant, Holland, Vincent Willem Van Gogh was the son of a Protestant minister, Theodorus Van Gogh. Exactly a year before his birth, his mother, Cornelia, gave birth to an infant, also named Vincent, who was stillborn, or dead upon birth. His grieving parents buried the child and set up a tombstone to mark the grave. As a result, Vincent Van Gogh grew up near the haunting sight of a grave with his own name upon it. His mother later gave birth to Theo, his younger brother, and three younger sisters. Not much is known about Van Gogh's earlier education, but he did receive some encouragement from his mother to draw and paint. As a teenager he drew and painted regularly. Van Gogh's uncle was a partner in Goupil and Company, art dealers. Vincent entered the firm at the age of sixteen and remained there for six years. He served the firm first in The Hague, the political seat of the Netherlands, and then in London, England, where he fell in love with his landlady's daughter, who rejected him. Later he worked for Goupil's branch in Paris, France. Because of Van Gogh's unpleasant attitude, Goupil dismissed him in 1876. That year he returned to England, worked at a small school at Ramsgate, and did some preaching. In early 1877 he clerked in a bookshop in Dordrecht. Then, convinced that the ministry ought to be his calling, he joined a religious seminary in Brussels, Belgium. He left three months later to become an evangelist (a preacher) in a poor mining section of Belgium, the Borinage. Van Gogh exhibited the necessary dedication, even giving away his clothes, but his odd behavior kept the miners at a distance. Once again, in July 1879, he found himself dismissed from a job. This period was a dark one for Van Gogh. He wished to give himself to others but was constantly being rejected. In 1880, after much soul searching, Van Gogh decided to devote his life to art, a profession he accepted as a spiritual calling. When in London he had visited museums, and he had drawn a little while in the Borinage. In October 1880 he attended an art school in Brussels, where he studied the basics of perspective (representing three-dimensional objects on a two-dimensional surface) and anatomy (the human body). From April to December 1881 he stayed with his parents, who were then in Etten, and continued to work on his art. At this time, too, he studied at the academic art school at The Hague, where his cousin Anton Mauve taught. During Van Gogh's Dutch period (1880–1886) he created works in which his overriding concerns for his fellow man were growing. His subjects were poor people, miners, peasants, and inhabitants of almshouses, or houses for the poor. Among his favorite painters at this time were Jean François Millet (1814–1875), Rembrandt (1606–1669), and Honoré Daumier (1808–1879). Complementing Van Gogh's dreary subject matter of this time were his colors, dark brownish and greenish shades. The masterpiece of Van Gogh's Dutch period is the Potato Eaters (1885), a night scene in which peasants sit at their meal around a table. Van Gogh decided to go to Paris in early 1886, partially because he was drawn to the simple and artistic life of the French city. His younger brother, Theo, was living in Paris, where he directed a small gallery maintained by Goupil and Company. Theo had supported Vincent financially and emotionally from the time he decided to become a painter, and would continue to do so throughout his life. The letters between the brothers are among the most moving documents in all the history of Western art. Vincent shared Theo's apartment and studied at an art school run by the traditional painter Fernand Cormon, where he met Émile Bernard (1868–1941) and Henri de Toulouse-Lautrec (1864–1901), who became his friends. By now Van Gogh was largely under the influence of the impressionists, a style of painting where the artist concentrates on the immediate impression of a scene by the use of light and color. Especially influenced by Camille Pissarro (1830–1903), Van Gogh was persuaded to give up the gloomy tones of his Dutch period for bright, high-keyed colors. Also, his subject matter changed from the world of peasants to a typically impressionistic subject matter, such as cafés and cityscapes around Montmartre, an area of northern Paris. He also copied Japanese prints. While subjects and handling were obviously taken from impressionism, there frequently could be detected a certain sad quality, as in a scene of Montmartre (1886), where pedestrians are pushed to the outer sides of an open square. Longing for a place of light and warmth, and tired of being entirely financially dependent on Theo, Van Gogh left for Arles in southern France in February 1888. The pleasant country about Arles and the warmth of the place restored Van Gogh to health. In his fifteen months there he painted over two hundred pictures. At this time he applied color in simplified, highly dense masses, his drawing became more energetic and confused than ever before, and objects seemed to radiate a light of their own without giving off shadows. During this period he also turned to painting portraits and executed several self-portraits. Among the masterpieces of his Arles period are the Fishing Boats on the Beach at Saintes-Maries (June 1888); the Night Café (September); and the Artist's Bedroom at Arles (October). spasms). The local population began to turn against him as well. Paul Gauguin (1848–1903), responding to his invitation, visited him in October 1888, but the two men quarreled violently. Gauguin left for Paris. Van Gogh, in a fit of remorse and anger, cut off his ear. On May 9, 1889, he asked to be admitted to the asylum at Saint-Rémy-de Provence, a hospital for the mentally ill. In the year Van Gogh spent at the asylum he worked as much as he had at Arles, producing 150 paintings and hundreds of drawings. Van Gogh suffered several attacks but was completely peaceful in between. At this time he received his first critical praise (a good review), an article by the writer Albert Aurier. During Van Gogh's stay at Saint-Rémy, his art changed markedly. His colors lost the intensity of the Arles period: yellows became coppers; reds verged toward brownish tones. His lines became restless. He applied the paint more violently with thicker impasto, the application of thick layers. Van Gogh was drawn to objects in nature under stress: whirling suns, twisted cypress trees, and surging mountains. In Starry Night (1889) the whole world seems engulfed by circular movements. Van Gogh went to Paris on May 17, 1890, to visit his brother. On the advice of Pissarro, Theo had Vincent go to Auvers, just outside Paris, to submit to the care of Dr. Paul Gachet, an amateur painter and a friend of Pissarro and Paul Cézanne (1839–1906). Van Gogh arrived at Auvers on May 21, 1890. He painted a portrait of Dr. Gachet and portraits of his daughters, as well as the Church of Auvers. The blue of the Auvers period was not the full blue of Arles but a more mysterious, flickering blue. In his last painting, the Cornfield with Crows, Van Gogh showed a topsy-turvy world. The spectator himself becomes the object of perspective, and it is toward him that the crows appear to be flying. At first Van Gogh felt relieved at Auvers, but toward the end of June he experienced fits of temper and often quarreled with Gachet. On July 27, 1890, he shot himself in a lonely field and died the morning of July 29, 1890. Arnold, Wilfred Niels. Vincent Van Gogh: Chemicals, Crises, and Creativity. Boston: Birkhäuser, 1992. Greenberg, Jan. Vincent Van Gogh: Portrait of an Artist. New York: Delacorte Press, 2001. Hammacher, Abraham M. Genius and Disaster: The Ten Creative Years of Vincent Van Gogh. New York: H. N. Abrams, 1968. Isom, Joan Shaddox. The First Starry Night. Dallas: Whispering Coyote Press, 1997. Lubin, Albert J. Stranger on the Earth: A Psychological Biography of Vincent Van Gogh. New York: Da Capo Press, 1996. Metzger, Rainer, and Ingo F. Walther. Vincent Van Gogh: 1853–1890. New York: Taschen, 1998. Schapiro, Meyer. Vincent Van Gogh. Garden City, NY: Doubleday, 1980. Hello, my name is Alyssa. I would like to know what college Van Gogh attended. Hi im Shivers YouTube2. and can u add his age. and all of his schools.